https://www.facebook.com/events/312528752729336/ G’day everyone! 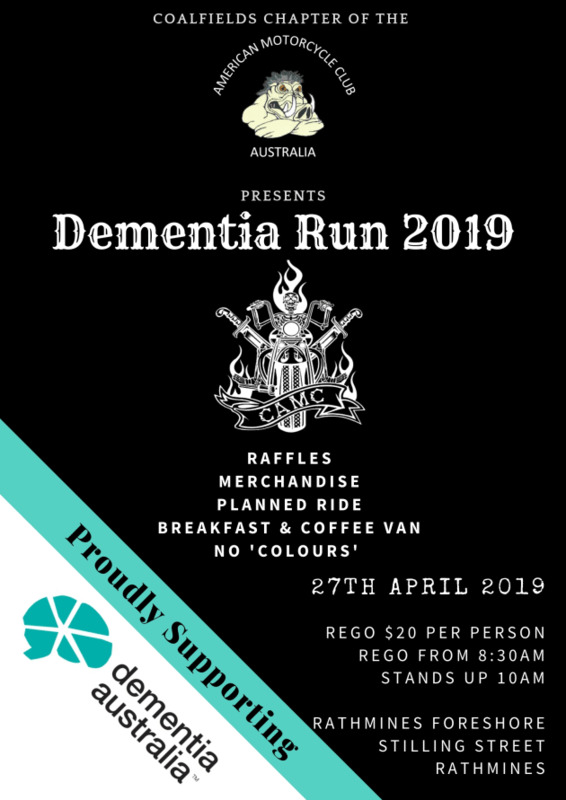 Each year the Coalfields Chapter of American Motorcycle Club host a fundraiser to raise money for Dementia Australia to support all they do for our loved ones affected by this debilitating disease. This year our Dementia Run will be on Saturday 27th April 2019 and will start from a new location. This year we will start on the shores of beautiful Lake Macquarie at Rathmines Recreation Area, Stilling Street, Rathmines. We will then head out on a planned ride in the Hunter Valley stopping at a pub for lunch and finishing at Medowie. Registration is from 8.30am Stands up at 10am. Entry fee is $20 per person. Breakfast will be available for purchase in the morning. There will also be a coffee van on site. Merchandise can be ordered through the facebook event or limited merch may be available on the day. We look forward to seeing you all there on the day!